VINYL ON VINYL: Cinemangarap Dec 2,3 and 4 ! Cinemangarap Dec 2,3 and 4 ! CineMangarap: Indie long, Short ito. CineMangarap is a film exhibition that aims to recognize Filipino Filmmakers and their talents that represent the artists of our generation by giving them a venue to showcase their films and to make them tell the stories they want to expose regardless of the connotations of mainstream or alternative cinema. 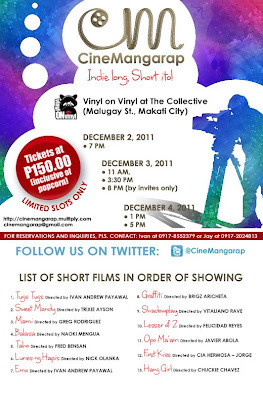 For its first event, CineMangarap presents, CineMangarap: Indie long, Short ito! It is a short film exhibition that will present 13 short films.